As expected for quite some time in the domain and SEO market, Google has began to grant preference to new domains. Based on recent research conducted by the agency Globe Runner, new domains perform better and incur lower cost with AdWords. 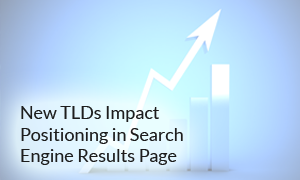 Two further studies point to a nTLDs’ stronger position in relation to gTLDs. The first analysis, prepared by the German company Searchmetrics, concerns the .BERLIN extension and its impact on the search results for specific keyword phrases. As it is clear from the analysis, the names within the extension .BERLIN achieve better results than the same names ending in .DE as well as .COM, when searching for products and services in Berlin. Addresses ending with .BERLIN on average position 1.18 higher in SERP than names within other „competitive” extensions. Specialists from Searchmetrics admit, however, that in order to achieve absolute certainty concerning Google preferences, more comprehensive studies should be carried out . 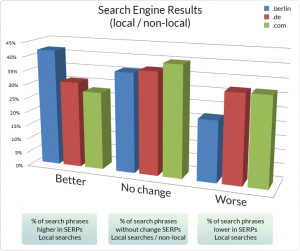 Nevertheless, the results obtained by the German SEO experts seem significant. As is apparent from the infographics above, the extension .BERLIN outperforms .DE and .COM in more than 40 percent local searches, and only in 20 percent of the cases its performance is worse. The .COM and .DE domains score lower than the nTLD in 32 percent of the cases. The second study has been conducted by Total Websites in Houston. The conclusions of this analysis are similar to the results obtained by Searchmetrics, however, they include global search. According to experts at Total Websites, Google uses the extension as one of the key elements in assessing the value of the address, and at the same time its position in search results. But it is not the value of a nTLD as such, but the treatment of them as keywords by Google that matters. This means that the EMDs (exact match domains), that is addresses with keywords corresponding to queries typed into a search engine, have a better position in the SERP than non-EMD addresses, for example brand names. Total Websites tests show, among other things, that in Google search results nTLD extensions are marked in bold if they are equivalents of keyword queries to search engines. This means that Google treats new domains on a par with keywords within the second level of a domain. As a result, if you type in the search box the phrase “SEO experts company”, for example, the page SEOExperts.company will probably be higher in the search results than similar phrase within the .COM (SEOExpertsCompany.com). That is assuming of course that both addresses offer similar quality content (tests with identical content for both domains risk penalty imposed by Google for copying content). Promoting nTLDs and EMDs in the search results is at odds with the official position of Google claiming that the domains are of no importance for SEO, and nTLDs will not be in any way preferable to the “old” functional domains or ccTLDs. On the other hand, as the authors of the study recall, the main slogan of the Google defining the main goals of the search engine says: “Google’s mission is to organize the world’s information, so as to make it universally accessible and useful”. It’s hard not to notice that the new domains with generic terms are an excellent tool to organize Internet resources according to the thematic criteria. The assumption that the search engine will use nTLDs for reorganization of net resources seems quite reasonable. The fact is that Google itself has invested millions in new extensions and probably will not give up the opportunity to provide them with informal support. It is hard to be surprised at the company’s hiding their intentions. Had they revealed their preference for new extensions, Google would come under fire from dotcom businesses for abusing its monopoly. If you are interested in registering a domain name under a new extension or any other extension, please click on the selected domain. Should you need help or more information, please do not hesitate to contact us by email at support@web-solutions.eu or via phone on 44 (0) 208 133 3994.